33 degrees and humid! Perusing the 7 day weather forecast posted on the wall at the Carnarvon Gorge Ranger Station, the first day’s outlook on the Carnarvon Great Walk is not exactly desirable. With packs loaded including water, we line-up for the all important pre-walk weigh-in. The digital scales show readings across our group of six, Mark winning the title with an eye watering 26 kg! 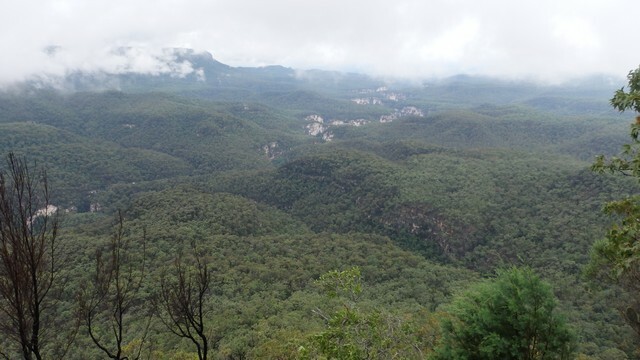 Situated approx 600 klms north-west of Brisbane – within the Central Queensland Sandstone Belt – the 87 klm Carnarvon Great Walk is essentially a six day loop around the Carnarvon Gorge. 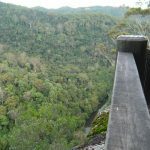 Opened in 2009, the Carnarvon Great Walk starts along the main walking track within the Gorge, before exiting out and atop the Great Dividing Range, eventually returning to Carnarvon Gorge via Boolimba Bluff. The first day is along the main walking trail, and is shared with those staying at the adjacent campgrounds, enjoying a day’s walking in the gorge. Whilst it’s a short day at only 10 klm and no elevation gain or loss, there are numerous diversions off the main track to points of interest. The exquisite Moss Gardens is the first of our side trips and the noticeable drop in temperature within the narrow gorge is a very welcome respite from the quickly climbing Central Qld heat. 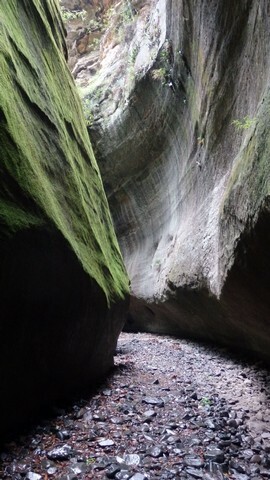 A little further along the trail, the Amphitheatre offers another impressive geographical sight and cool spot to rest. At each of these side trips, we drop packs at the turn-off junction rather than carry them in. On returning from the Amphitheatre, my negligence in not fully securing my pack, has resulted in an unwelcome and uninvited intrusion by one of the local fauna. With a hole ripped in the side of my food bag, I assess the damage and account for any losses; 3 muesli bars, 2 packets of sesame snaps and a slice of banana bread. Whilst trying to ascertain the culprit, movement overhead reveals a guilty looking crow and appointing myself judge, jury and wanna-be executioner, I find it culpable on all charges. Lamenting the loss, I realize it could have been worse and a lesson learnt. 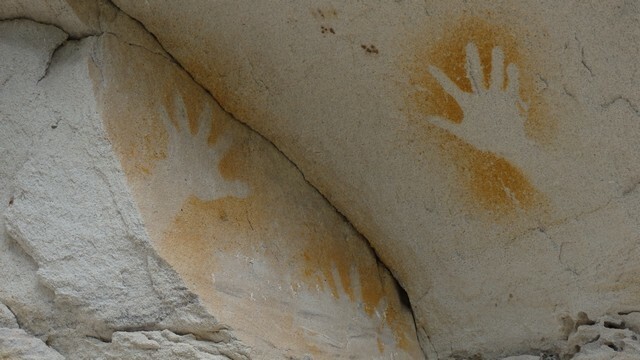 We coincide our visit to the Art Gallery to hear ‘Fred’ – an aboriginal guide here for some 30 years – as he explains the significance and meanings of the many ancient drawings that adorn the sandstone wall. Fred – who is retiring in the ensuing weeks – brings the paintings to life with his enthusiasm and knowledge, I feel privileged for the opportunity to hear him. 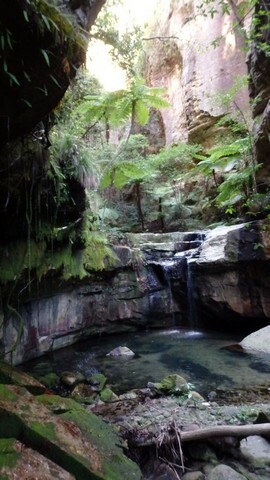 Further side trips to Wards Canyon and Cathedral Cave offer more opportunities to explore the highlights of the Carnarvon Gorge and walking under the tall gums and fan palms, along with some 22 crossings – on mostly dry stepping stones – over Carnarvon Creek, helps to keep the heat at bay. 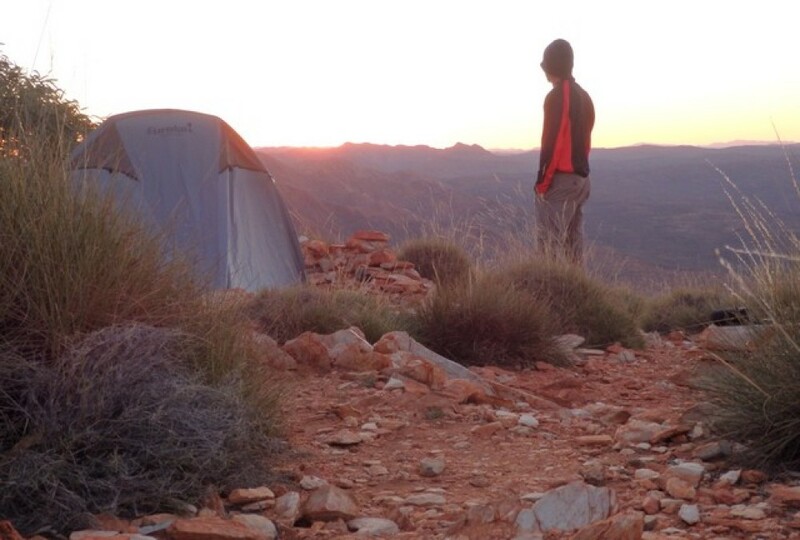 We arrive at Big Bend Walkers Camp late afternoon, giving time to pitch tents and relax into the evening. Unfortunately mother nature had one more trick up her sleeve. Just on dark, overhead clouds graduated from light drizzle to a solid downpour. Albeit brief, but long enough for us to adjourn to the sheltered balcony of the toilet block for some unusual ambiance to accompany our dinner. Overnight rain – at times seemingly quite heavy – has equated to a restless sleep. A little more rain as we pack up the tents, amplifies the inconvenience. A short backtrack to Boowinda Gorge which we follow for nearly a kilometre. 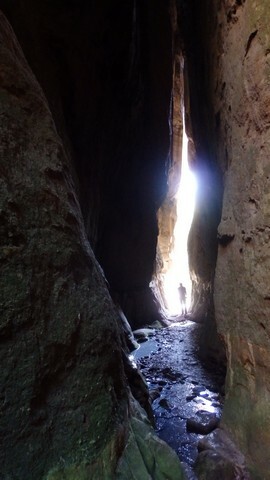 Boowinda Gorge is only a few metres across, and it’s stone littered floor and smooth sweeping sandstone walls rising directly up to the narrow sky above, make it worthy of a visit on it’s own. Then begins the long slow hard slog from the canyon floor to atop Battleship Spur. 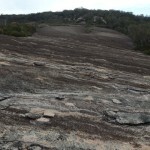 With some 600 metres in altitude gain over only 4.2 klm, this is the Carnarvon Great Walk’s greatest challenge. 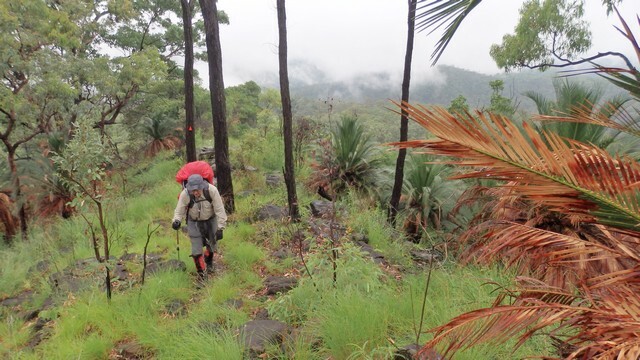 As fortune would have it, the cloud and light drizzle – chastised only hours earlier – are a very welcome companion on this section of the Carnarvon Great Walk. Yesterdays heat gratefully in the past. 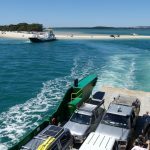 The payoff for this seemingly never ending ascent is – as read from the Carnarvon Great Walk brochure – ” one of Southern Queensland’s most spectacular, and at 1074m above sea level one of its most elevated, views”. Unfortunately upon arrival, we could see nothing but fog! However whilst eating lunch in despair – feeling deprived of my just reward – the cloud parts for a few glorious minutes, allowing a breathless vista looking down over the Carnarvon Gorge in it’s entirety. 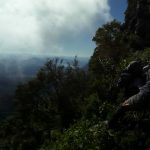 The next few kilometres are a relatively flat walk along a high broad ridge, dropping off into deep valleys either side. 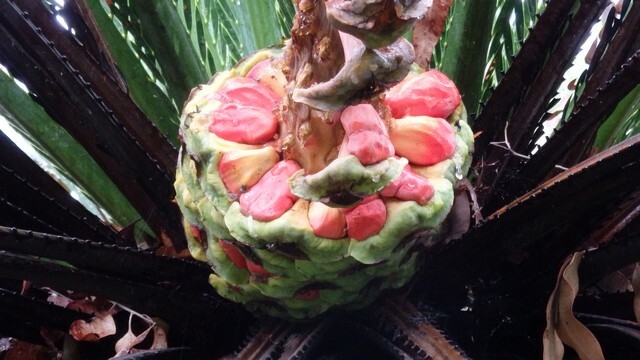 Conditions were perfect, the sun sheltered behind cloud as we strolled through knee high grass – painted bright green thanks to recent rains – and open eucalypt woodland interspersed with the magnificent cycads that dominate this area. The heavily grassed woodlands would easily lend itself to grazing. 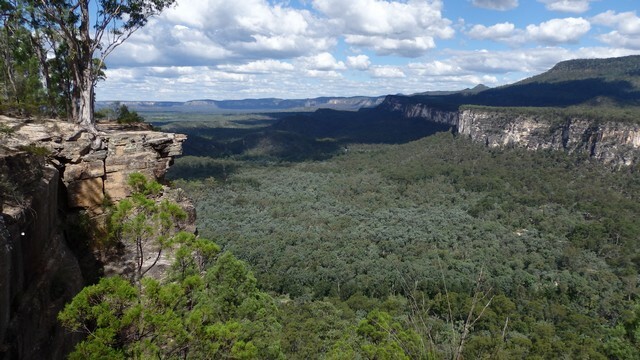 From the 1860’s, much of the Carnarvon Great Walk route was cattle stations, until Carnarvon Gorge NP was gazetted in 1932, with further sections – including Mt Moffat NP – in the ensuing decades. From here we lose the altitude we fought so hard for in the morning, gradually descending to Gadd’s Camp, close to the East Maranoa River. With the sun still refusing to appear, we immediately pick-up a fire trail which leads us out of the valley, the last section of which is another steep climb to a high ridge. On paper, the climb is only a 1/3 of yesterdays punishing effort, but with legs still in recovery mode, reality offers a disproportionate view. We follow the narrow ridge line – views either side – before crossing lightly timbered silver leafed ironbark grassland and a gradual descent to West Branch Camp. Not far from the campground, we walk through a mini forest of huge eucalypts. 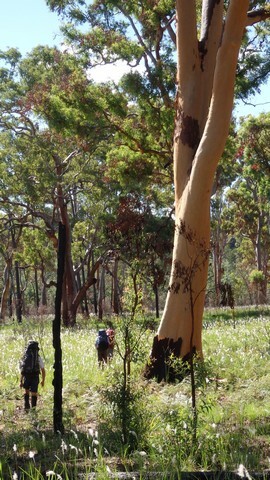 These magnificent gums – with their bark recently shedded – exposing a smooth timber which glowed a brilliant orange like colour in the afternoon sun; which has finally made an appearance after nearly 2 days. The ‘orange forest’ is stark and brutal contrast to the recently burnt out landscape that surrounds the campground. Crossing the suspension bridge over the west branch of the Maranoa River at the walkers camp – the high expectations of a cool refreshing swim that I have harboring for most of the day – are shattered with nothing but a stagnant pool to be found. Today is not only the longest day in terms of distance, but a 400m gain in altitude thrown in for good measure. Fortunately the sun’s force is blunted with an intermittent cool breeze that makes the long slow climb onto the Consuelo Tableland, a much easier proposition. The ‘Mahogany Forest’ greets us at the gateway to the Consuelo Tableland. These tall magnificent trees blocking the sun, provide a stark and welcome contrast to the open woodland that surrounds it. At one point whilst resting on the trail, I count five different species of ants within an arms reach. Painful bites from a couple of bull ants are a reminder that this harmony and co-habitation doesn’t extend to humans. We walk the final 7 klm across flat terrain – assisted with the cooler climate at this altitude – to reach Consuelo Camp in the late afternoon, where we collapse from our long day on the trail. Today is only 14 klm, free of any sweat inducing climbs and with virtually no elevation gain or loss. Soon after leaving camp we leave the main track to navigate our way through waist high grass to Consuelo Peak. 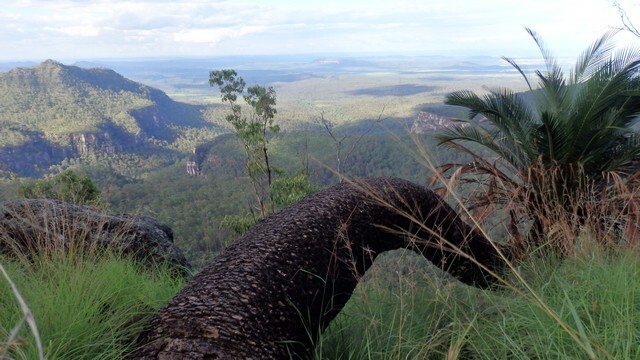 The heavily vegetated, flat broad mountain top offers no views; only the satisfaction of standing on the highest point in Central Queensland at 1232m! 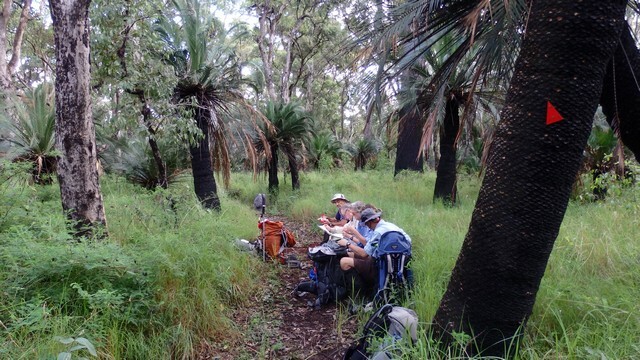 The flora on the high tableland is dominated by tall eucalypts, cycads, bracken fern and grasses, creating a beautifully unique environment refreshingly free of lantana. The evidence of wild pigs – from their ‘diggings’ – is surprisingly apparent. 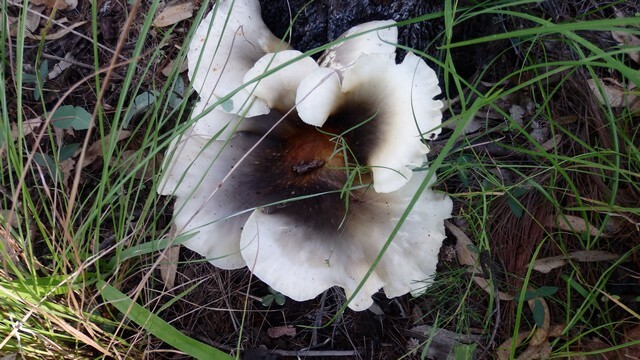 At times, can barely walk a few minutes without seeing the telltale upturned soil, leading one to assume their numbers are disturbingly high. In a conversation with the park ranger at the conclusion of the walk, he confirms that a targeted baiting program has recently begun with good success to date. Setting up tents at Cabbage Tree camp, we walk a few hundred metres to the edge of Jimmys Shelf; a steep cliff from atop which one is afforded splendid views looking down into Black Alley Gorge and out to the grazing and cultivation plains visible in the distance. The final day of the Carnarvon Great Walk starts with a long descent and numerous opportunities to sample the views on both sides of the ridge. The Cabbage Tree Palms and the clear running water of Arch Creek – our first since day one – offer an opportunity to cool off and enjoy morning tea. The midday heat at the lower altitude is amply evident and makes the walk to Boolimba Bluff lookout seem far more difficult than it normally would. The short climb up the apply named Demon’s Ridge, only adds to the discomfort. Enjoying a timely lunch at Boolimba Bluff, we sample the views of the mouth of Carnarvon Gorge and beyond. A last opportunity to witness the geography of this fascinating landscape from a high vantage, before descending back to Carnarvon Creek. Well earned drinks at the finish! Our final act before driving back to Takarakka Bush Resort, is to sign out at the Ranger Station. 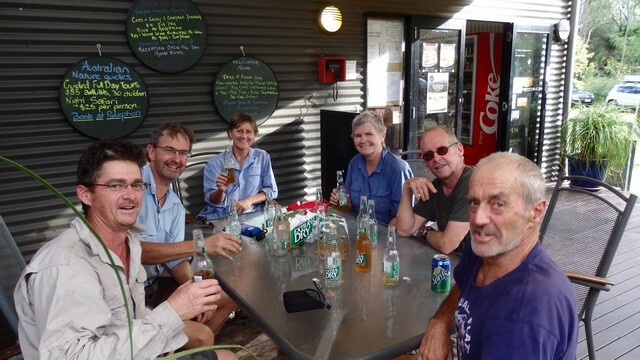 Later we reminisce – with cold beers, wine and a pre-booked two course dinner – of our adventures on the six day Carnarvon Great Walk. The Carnarvon Great Walk may not be as popular as it’s Queensland Great Walk cousins – especially those in the state’s South East- but probably fair to say that a combination of distance, location, isolation, climate & terrain make the Carnarvon Great Walk a sterner test and a worthy challenge. 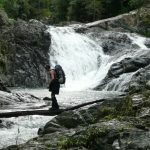 This entry was posted in Multi day hikes in Australia and New Zealand and tagged Battleship Spur, best bushwalks in queensland, best walks in queensland, Boolimba Bluff, Carnarvon Gorge, Carnarvon Great Walk, Consuelo Tableland, Hiking in Qld, Multi-day hikes in Qld, Qld Great Walks, Takarakka Bush Resort by danthewanderer. Bookmark the permalink. lovely story and photos Dan. Particularly enjoyed the video. All of it together gives a great taste of the park and the walk! Cheers Christina, its a pretty cool place. I’m really liking your site! Hi dan – thanks for the write up! 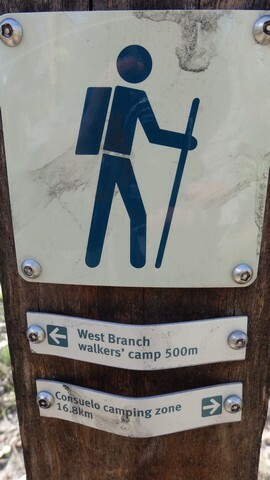 Could you give some advice on how well the trail is marked? Is it an actual train with markings, a la the European GRs, or is there a lot of route finding required? We had no real troubles with trail finding, couple of times was a bit faint, but for the most part was quite clear with numerous signposts. However having said that, I could see where if you went say early autumn the trail may be become faint due to lack of walkers during the hot summer months & also vegetation/grass growth hiding the trail. Also any fires may make the trail difficult to see, along with burnt out signposts etc. The park rangers were very helpful & are keen to see more walkers using the Trail, don’t hesitate to give them a call for any updates etc. Hi Dan, I’m thinking of doing this walk in a month, and was just wondering what you would say the required fitness level is? Hi Rhiana, it does require a good level of fitness. Certainly of the Qld Great Walks I would rate it the hardest, but in no way difficult. 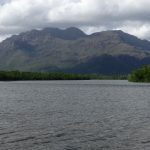 The distance between campsites are longer than the other Great Walks (keep an eye on the time with the short daylight hours) and it is a bit of slog up Battleship Spur on the 2nd day with a full pack. No doubt you already aware, but just in case this time of year the nights will be very cold! Have a great time and let us know how you go! I am heading up there from Roma this week, shortest week of the year. Do you have a gpx file of the track? Sorry, no I don’t have GPX file or anything similar. Enjoy the walk, hope it all goes well! Loving the write up! My family and I are going to do the trek next year, round start of September. I was wondering how accessible water is along the way? I see a couple of the campsites have limited water that’s all. Hi Kara, thank you. We had no issues with water, but we did have a heavy downpour on the first evening. Whilst there are creeks etc on the lower sections, I don’t recall much on the higher section of the walk, so yes you would be reliant on the campsite tanks. Best bet would be to give the rangers a call prior to arrival, we found them very helpful. I’ll definitely contact them before heading there.